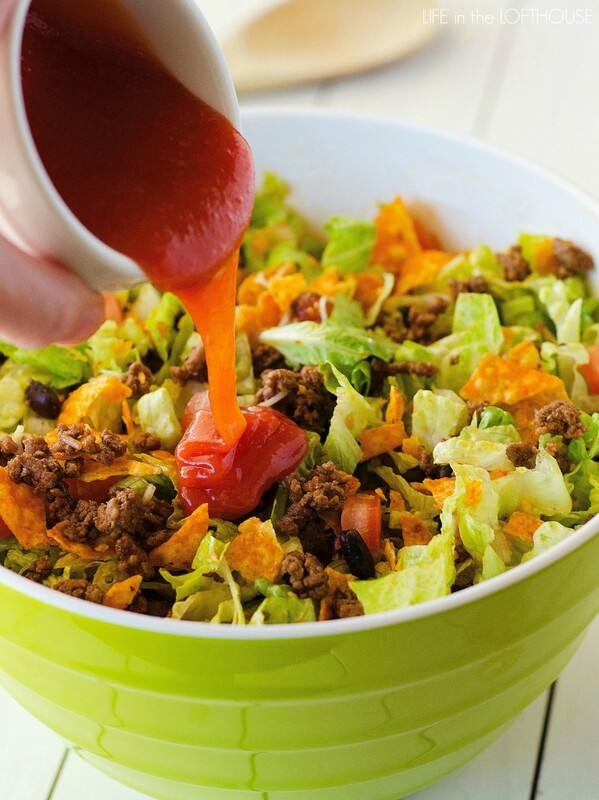 This Doritos Taco Salad is loaded with seasoned ground beef, black beans and more. What makes this salad so delicious is the nacho cheese Doritos! My family and I love this salad. It is packed with all kinds of deliciousness. Seasoned ground beef, black beans, cheese, lettuce and don’t forget the Nacho cheese Doritos. 😀 They make the salad! This Doritos Taco Salad comes together in just about 20 minutes tops! Salads like this are my go-to for easy and simple dinners. I especially love to make them during the summer time, so we don’t have to turn on the oven. The version I’m sharing today is pretty basic, but absolutely delicious, and the one I typically make. Sometimes we add corn, chopped green onion and even use different dressings to mix things up. I’ve even used the Ranch flavored Doritos instead of the nacho cheese, and it’s pretty awesome with those, too. Most importantly, with any salad, is the dressing. Feel free to use your favorite dressing! You don’t have to use Catalina dressing. Sometimes I serve it with ranch too. It’s delicious either way! 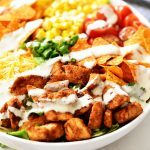 This is a taco salad my boys and I would love! This salad has me drooling over here! I love Doritos – they’re my favorite chips ever! – so this salad is right up my alley. I totally wish I had a bowl right now! YUM. Gotta love taco salad night – and something besides ranch dressing! Love the tang and sweet of Catalina. Perfect for summer! This looks incredible. I could definitely see it being a hit at my house. I’ll be trying it out for sure. Got a similar recipe from a friend and like using the Chili/BBQ Fritos in place of the Doritos! 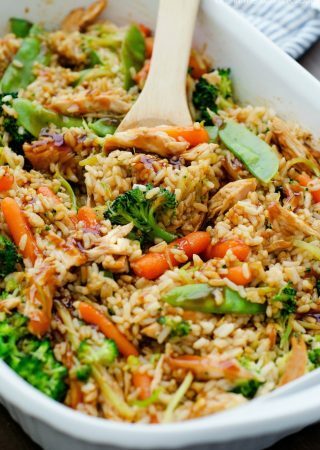 I make this dish all the time and it is delicious! But do note that the Doritos do get soggy after awhile. I haven’t figured out how to prevent that. Any suggestions? Karen, I don’t add the Doritos until right before serving! What else do you serve with this? I add the Doritos first on my plate then the salad last the dressing. That way if you have any salad left you can save it for the next day. I have made this for years. Everyone loves it. I always have to make it for our church potlucks or people will be disappointed. Sprinkle the doritos over the top of the salad. I have a similar recipe and I put the chips in each individual serving. Then if you save some salad for later, you can add the chips and have a crunchy salad again. I know what you mean, the only other solution is to cruse the dorito’s and have sone in a bowl on the side and add them to the salad when it’s put in the bowls to eat it, mix them in. I would break them up and have them on the side and then add them individually because we have salad left over for the 2 of us because it’s a big salad for 2 and that what we do otherwise they do get soggy! You can also have them on the side and everyone adds to their own. Let everyone put their own Doritos on their salad. That’s what we do. Leave Doritos on the side and let people add it themselves. That way they are always fresh. I have made this since I was in high school. I would use the plain doritoes which are very hard to find now. (It was your only choice back then lol). To keep the doritoes from getting soggy I would never mix them in with the salad but would add as I served salad. I always used Ranch dressing. My dh is Diabetic and we are trying to watch out for his type of diet. If I skip the dorritos…doesn’t everythng else fit ok? I did fix it tonight for my dh. I used Bison ground meat because its lean and high in protein. Did not use the dorittos though. LOL He probably would have liked that. Layered and mixed with lettuce/spinach to make a salad. I only had ranch dressing but it was good. Man this picture took me right back to my childhood and the hundreds of summer BBQs my mom had! This was definitely a family food staple! Went to the store and bought all the ingredients for tomorrow’s dinner!! I make this all the time. I add a small can of sliced black olives and sometimes I add a chopped green onion. Delish! I made this tonight for dinner. It was so good. Everyone loved it. I’ll definitely be making it again. This is a great recipe! I have been making it since 1975! Much better tasting if you use creamy Italian dressing instead. Can I use thousand island dressing? I make this but use creamy Italian dressing instead. We used to eat this growing up but instead of catalina we used French dressing mixed with Tapatio hot sauce And diced red onion and a bell pepper. how could i make this without the meat? i mean what could i add the taco seasoning in? I make this a lot, and don’t always use meat. Instead I use thousand island dressing with a couple tablespoons of taco seasoning mixed in the dressing. That’s the way we like it! To keep Doritos from getting all soggy I present them in a separate bowl so guests can top there salad with them. Made this yummy taco salad for the first time last night and it was a BIG hit! Lots of flavor. Changes I made: used ground turkey with sautéed onion instead of beef and Frontera seasoning packet for chicken tacos from Whole Foods. (It’s not a powder, little packet with tomatoes and taco seasoning sauce. Different flavor – but good.) I also added avocados and next time (there will definitely be a next time) I’ll toss in some corn. I also used Whole Foods 365 Nacho Chips – they are thicker and not as salty. I never would have thought to use Catalina/French salad dressing and it was the perfect match. Thanks for a fun, easy, flavorful, big bowl salad! Oh, I also used three romaine hearts and made three big salads. This was good and all of my kids loves it. Thank you! I have made this for years. 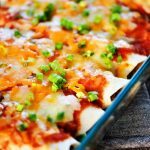 I don’t use taco seasoning (I imagine it would give a fantastic flavor) and use chili beans instead of the black beans. My original recipe called for advocado but use it. LOVE IT!! My family has made this salad for over 25 years, except it was made with Taco Flavor Doritos and we switched to the Southwest Chipotle Salad Dressing. Love this salad. I always use my leftover taco meat to make a little Doritos taco salad for lunch the next day. What kind of side would you have with it? It’s really a meal in itself but I guess you could have Spanish rice or corn on the cob or whatever you like. You really don’t need any sides as it’s a complete meal by itself. You might serve a nice light dessert afterwards. Great tasting salad. we added the chips to a plate and piled the salad on top. Delicious. I just made this came out great! A few things I did a little different ,I tossed the salad portion with ranch dressing , and mixed in salsa with the ground beef to make it a little richer. 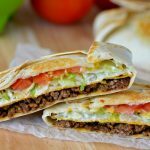 We love guacamole so added a dollop of that on top, also we used the taco flavored doritos – the old school flavor that came out after plain and before nacho cheese, gave it that nice taco flavor – so quick to throw together will do this again – Thanks! I love Doritos salads! Such a great childhood memory for me. This looks delish! Try with venison instead of beef!!! AMAZING! I made this exactly as posted. It was good but I would recommend not using a cup of catilina dressing. It was too much. I think 1/2 cup at first would be fine. This is delicious. Made it for dinner and will definitely be making it again. I liked it better when you could get “taco flavor” Doritos. 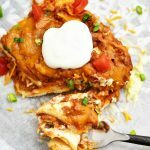 My whole family loved this taco salad! I changed it up a bit. I added some red onion and canned corn and used Cool Ranch Doritos instead of the Nacho as we prefer the Cool Ranch flavor and I think it gave the salad flavoring some extra zing! Thank you for yummy recipe! Sounds delicious. Any other dressing you could suggest? We don’t like catalina. We like to use ranch dressing too! I have made this before many times, but I always add a big can of kidney beans, WITH the juices in the can. EXCELLENT! I mix the Catalina’ with equal parts Italian dressing….he combination of the two is amazing on this salad! AHHHHHHHHHHHH!! I love this stuff! my husband isn’t a huge Taco lover, but he loved this salad!!! 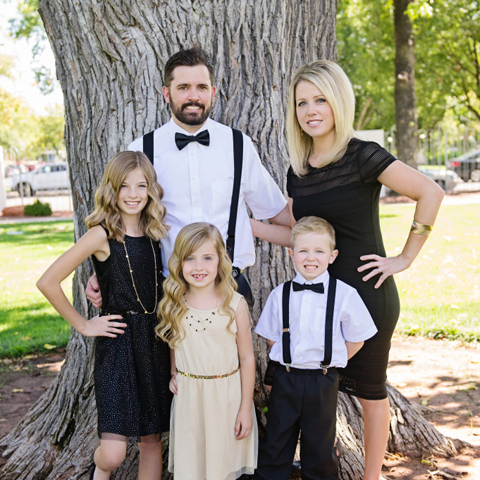 It is a favorite in my book!!! Can’t wait to make it again!!! I’m making this today for the first time for a friends baby shower. Another friend of mine made it every year for a pig roast we attend and she always used green goddess salad dressing. It was so delicious! I will be using green goddess dressing as well. Glad it was a hit for you! Using Italian dressing sounds delicious!